Staff at the Roosevelt Point apartment complex said the familiar purple hue of the seventh-floor hallway wasn’t intentional. Either way, it offers a campus-like comfort to the Grand Canyon University students who will call the complex home this fall. GCU juniors and seniors have the opportunity to live off-campus this year at the newly constructed complex in Phoenix’s Art District. 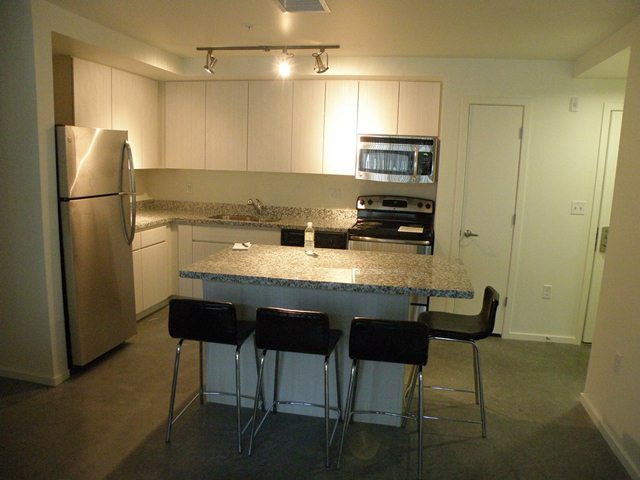 The complex, located at Roosevelt and Third streets, less than 10 miles from the main campus on Camelback Road, offers students an affordable housing option that is close to the University and to downtown attractions such as Chase Field, the Phoenix Convention Center and First Fridays. 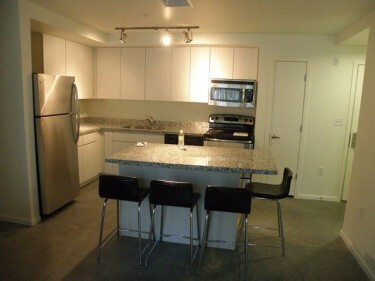 The kitchen of a typical unit at Roosevelt Point includes a stove, microwave and refrigerator. GCU’s Office of Student Affairs faced a dilemma when the high influx of new students left only 80 beds available for late or future students. John-Paul Reiger, GCU’s director of resident life, knew the University would need more living space or it would be forced to turn away students. Janay Poole, GCU’s housing operations manager, lives near Roosevelt Point and suggested it as a student residence option. GCU leased 80 beds at the complex and emailed juniors and seniors regarding the opportunity on July 15. Within two days, Reiger’s email inbox was overflowing, with more than 160 replies. The eight-story complex, which finished construction in mid-July, is similar to the modern aesthetic of campus residence halls. All apartments come fully furnished with couches, tables, chairs, Tempur-Pedic mattresses, and washers and driers. GCU scholarships and loans can be applied to the cost of rent, but students must sign a lease through both GCU and Roosevelt Point. The $2,200 rent per semester is in line with on-campus dorms and includes cable, electric and all other utilities plus a private, covered parking spot. Students will be considered commuters and will be responsible for transportation to and from campus. Campus meal plans will be waived for those living at Roosevelt Point. Each student has their own room, bathroom and walk-in closet in a 1,250-square-foot, four-room apartment with a shared living room, patio and kitchen that includes a stove, microwave and refrigerator. GCU student apartments occupy sections of the first seven floors and are on the same wing of the building. The community includes two swimming pools with spas, a game room with a pool table and video games, a fitness center and free tanning. The apartment complex is not gated, but only residents with a pass point key can gain access into the building and parking garage. Community Manager Ashley Scott said the complex plans to incorporate off-duty police patrols. Scott said that although Roosevelt Point is not designed to be a college residence, it is student-oriented and geared toward a younger demographic. “We have a really diverse community here, and I think it is attractive to students because of the amenities and proximity to downtown,” she said. GCU junior Jerome Garrison made the move off-campus for a change of scenery, he says. Some students selected Roosevelt Point because it grants them the freedom of living off-campus while remaining ingrained in the University. Senior Maybelle Concepcion said the freedom and independence enticed her. Junior Jerome Garrison, 20, a member of the Antelope men’s basketball team, said he sees off-campus housing as an opportunity to relax and cherish what he often took for granted while living on campus. 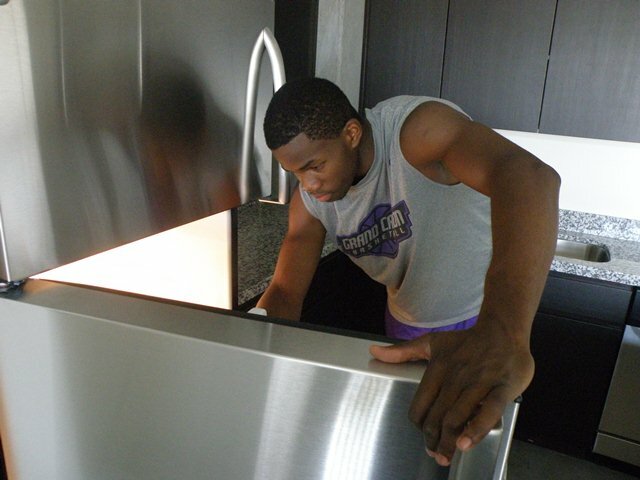 “To me, it’s just something different after two years of being at GCU all the time. I thought it would be nice to have a change of scenery,” Garrison said. Contact Cooper Nelson at 639.7511 or cooper.nelson@gcu.edu.